Harry Perez-Nahuat, 11, drives a simuator as visitors interact during the Texas Department of Transportation driving awareness campaign “Talk, Text, Crash” at La Plaza Mall in McAllen on June 22, 2017. McALLEN – Last year, two teenage girls were killed when the driver of the car they were in checked her phone and collided with an 18-wheeler. Now, those girls are the faces of a statewide campaign to end distracted driving. Brianna and Jade Robinson’s story is one way representatives from the Talk, Text, Crash campaign raise awareness about the dangers of distracted driving. 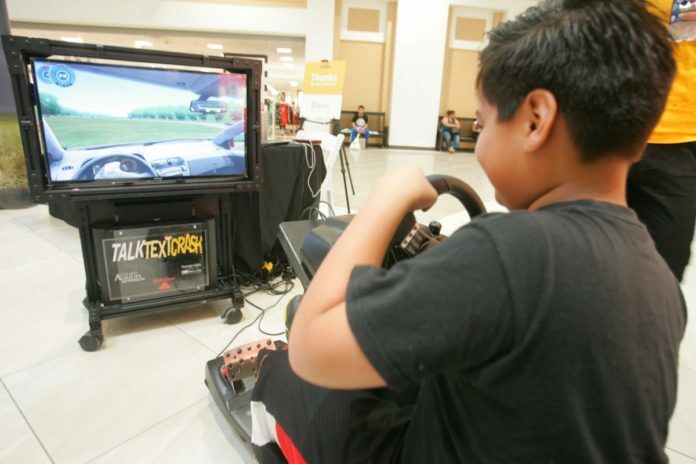 They spent Thursday at La Plaza Mall, inviting shoppers to try a driving simulator, follow conversations on a giant iPhone, and engage in stories about Texans who died in distracted driving accidents. Distracted driving does not only mean talking and texting – it includes social media, using the internet, changing the song playing on the phone or radio, or searching for an address. Amadeo Garcia, lead brand ambassador for the campaign, said he wants people to know the real danger is holding the phone instead of the steering wheel. The Texas Department of Transportation found that in addition to those 455 deaths caused by distracted driving accidents, another 3,000 people were seriously injured and more than 109,000 crashes were reported. Garcia and other representatives spent the last three weeks traveling around the state for the annual campaign. The Valley was their second to last stop, and Garcia said it was an especially receptive group. But it takes more than just listening to change the statistics. Garcia said people have to practice accountability, or in his case, experience it personally to understand the risks. That scare led him to stop using his phone while driving and tell everyone he knew to do the same. He recognizes the fear when people tell him they’ve seen drivers texting while a baby sits in the back seat. Texting takes drivers’ eyes of the road for an average of five seconds, and at 55 mph, that’s the equivalent of driving the length of an entire football field while blindfolded, according to the National Highway Traffic Safety Administration. What stands out most to Garcia is the invincibility drivers feel before a crash. He has heard the phrase “I never thought it would be me” a disheartening number of times. Although many admit to being guilty of distracted driving, they may not realize the full extent of the problem.